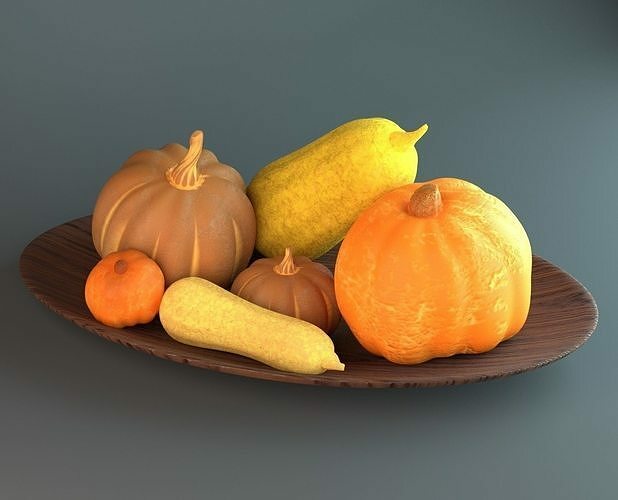 This is a 3D representation of a small collection of pumpkins and squashes with different colours and textures on a wooden plate. All the 3D items in the scene (pumpkins+squashes+plate) have PBR materials: texture; occlusion, normal, and displacement maps. The image textures of the pumpkins and squashes have been hand-painted by the artist. The PBR maps have been generated based on the painted image textures. All the converted formats of the original blend file have been tested before packing and uploading. Previews of the materials used, wireframe, matcap, and PBR materials have been included to give an idea about the technical details of the 3D render.